Everybody’s favorite wimp, Greg Heffley (Zachary Gordon), is back for three times the fun in the latest film based on the super-popular book series! When Greg’s dad (Steve Zahn) threatens to send him to military school if he doesn’t stay out of trouble, Greg finds all-new ways to land himself in the doghouse! For starters, Greg’s in over his head when he pretends to work at the swanky country club where Rowley’s family has a membership. Things don’t go much better on a father-son camping trip with the Wilderness Explorers, and then there’s the Heffley’s new dog, Sweetie, who fetches even more trouble for Greg in this hilarious family film! We are huge fans of Diary of a Wimpy Kid Series in our house. We've seen the first couple of movies and absolutely loved them, which got my daughter into reading the books, even though they came out first. As long as she's reading, right? Like the first two movies, Dog Days is filled with another new adventure for Greg. This time he needs to stay out of trouble, but as always, there are always things getting in his way to prevent that from happening. This third edition to the series did not disappoint me. I absolutely loved this movie and can't wait for the next installment. If you have kids that are fans of this series you should definitely check this movie out, they'll love it! 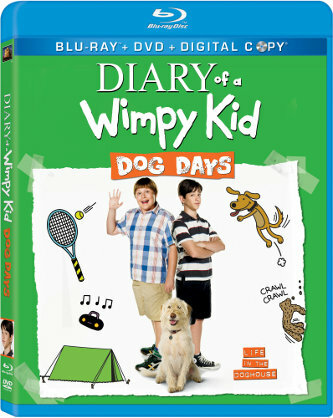 Diary of a Wimpy Kid: Dog Days hits stores today, December 18th! Check out the deleted scenes clip we have for you below! Disclosure: All opinions are my own. I received Diary of a Wimpy Kid: Dog Days at no cost for the purpose of this review. No other compensation was received.